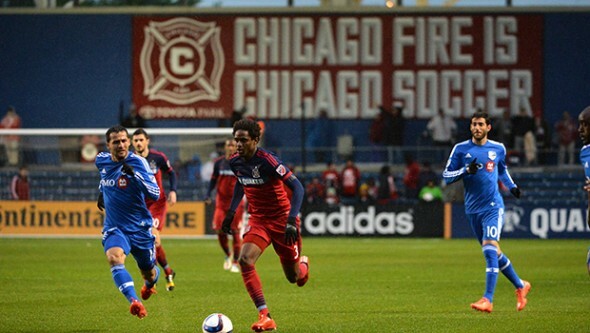 The Sounders traded a first-round draft pick for left back Joevin Jones from the Chicago Fire. In the second round, the Sounders drafted defender Tony Alfaro and midfielder Zach Mathers. The Seattle Sounders acquired three players as a part of the MLS SuperDraft Thursday. The Sounders traded their first-round pick and allocation money to the Chicago Fire, acquiring 24-year-old left back Joevin Jones. In the second round, the Sounders drafted center back Tony Alfaro and midfielder Zach Mathers. Jones, a Trinidadian national, started his pro career in the TT Pro League with W. Connection, landing in Chicago after a short loan to HJK Helsinki. Jones made 28 appearances for the Fire in 2015, scoring one goal. Jones has 37 caps for Trinidad and Tobago, including 2013 and 2015 trips to the CONCACAF Gold Cup. Seattle already owned Orlando City’s second round pick and used it to select Alfaro from Division II Cal State-Dominguez Hills. Alfaro, a Santa Barbara native, was a named a first-team All-America by the National Soccer Coaches Association of America (NSCAA), started 21 games as a senior and was named the California College Athletic Association’s defender of the year. Mathers, a 5-foot-11 midfielder from Keller, TX., started all four years of his collegiate career at Duke. Mathers notched eight goals and eight assists as a senior for the Blue Devils to earn a spot on the All-ACC First Team. “He’s a very smart soccer player, a good reader of the game, another good technical player, that played a little bit further forward in college but we might project him to play a little bit deeper in midfield as a pro,” said Lagerway. Of the three, Jones will be an immediate contributor. His speed and experience at left back will make a strong case for him to become the starter over Oniel Fisher and Dylan Remick, who alternated through the spot in place of an injured Leo Gonzalez last season. The draft selections were characterized by Lagerway as picks for the future, to flesh out Seattle’s farm system. “The most important message I can give is that playing for S2 is not only not a problem but it’s an opportunity,” he said. “It’s an opportunity for these kids to show us what they can do, get in games on a regular basis, while potentially training up with the first team. Still, Lagerway said that everyone would be on equal footing as the players reported to spring training camp. On the whole, Lagerway said that the team he expects to use next season is, at this point, assembled. The Sounders will use early February to play three friendlies in Arizona against the Timbers, Whitecaps, and Mexican Celaya FC in preparation for its CONCACAF Champions League, two-legged knockout match against reigning champs Club America on Feb. 23. MLS commissioner Don Garber took the opportunity of the SuperDraft to weigh in on Jordan Morris’ professional future. Morris, a Mercer Island native and a Stanford star, just extended his training stint with the German Bundesliga’s SV Werder Bremen, and has been praised by the team’s front office. Garber, who has butted heads with USMNT coach Jurgen Klinsmann over whether American talent should play domestically or go abroad, said he hoped to see Morris in Rave Green. King 5 reported Thursday that Stormy Keffeler, Miss Washington USA, may have stabbed former Sounder Marco Pappa last month. Keffeler, a former player in the Legends Football League (better known by its previous name, the Lingerie Football League) for the Seattle Mist, may have her Miss Washington title revoked after news in April that she was arrested in April for DUI. Keffeler’s blood-alcohol content was allegedly three times the legal limit. Pappa, who served a league suspension of his own after a DUI arrest in July, was reportedly found with Ms. Keffeler by police with a stab wound in the abdomen in a South Lake Union apartment before being rushed to the hospital for surgery. King 5’s report said Keffeler and Pappa repeatedly changed their stories regarding what happened, and that the investigation is still on. Pappa was acquired by the Colorado Rapids after he was waived by the Sounders. Jones and the draft picks look like good defensive depth, so,etching you can never have enough of in a salary cap league. Morris, if the hype is to be believed, can easily make up for the losses of Gonzalo Pineda and Pappa … if he stays stateside. As for Pappa, with the DUI and now this, something’s wrong. Hope he can get his life sorted out.